[caption id="attachment_69" align="alignleft" width="300" caption="Syma S107 Mini Helicopter"] [/caption] If you enjoy flying remote control helicopters, you will enjoy the Syma S107 mini remote control helicopter. One of the smallest and lightest remote control helicopters available on the market today, this mini remote control toy is a product of the manufacturer Syma. These micro remote control helicopters are ideal for beginners, as well as advanced hobbyists as they are smaller, durable and less expensive. The Syma S107 can help you gain some practice before you move on to the more expensive and advanced remote control helicopters. This micro helicopter is small enough to fit into the palm of your hand with an approximate length of 7.5 inches and weighing a mere 34 grams. Featuring the newest gyroscope technology, this helicopter achieves stabilized heading which isn’t common in other older mini helicopter models. 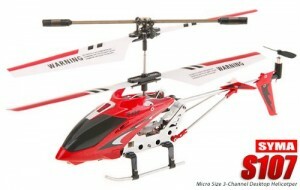 Its high grade metal body frame makes it stand out from other mini remote control helicopters made out of delicate plastic. Another key advantage of its small size and light weight is that this toy is very portable, thus enabling you to take it along wherever you wish to go. Moreover, it is also ideal for indoor flying because of its super wide infrared control. The Syma S107 is controlled by a 32-level high precision speed controller which allows for automatic stabilization of the rotor blade system, thereby guaranteeing a steady lift off. The S107 is also a 3 channel indoor heli, which means that it is able to move up and down, left and right as well as forward. This toy is able to function because of its 2 solid motors which power the high tenacity propellers, along with a third motor in its tail rotor. Its high capability Li-Poly battery also allows for longer flight times. This remote control helicopter is able to charge directly either by using its controller which is powered by “AA” batteries, or via a USB cable. Colin Nelsen loves playing with RC toys, having grown up with them. His favorite one is the Syma S107, and he enjoys meeting other people who share his passion for RC.